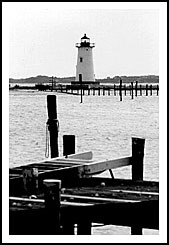 The lighthouse marks the entrance to Edgartown Harbor, off Water Street. In the late 1700s and early 1800s Nantucket and Martha's Vineyard developed a booming whaling industry that comprised of almost a quarter of America's whaling fleet just before the Revolution. The original lighthouse built in 1828, sat offshore so the keepers had to row a short distance to reach the mainland. In 1830, a wooden causeway was built to the lighthouse and became known locally as the "Bridge of Sighs," because men about to leave on whaling voyages would frequently walk there with their wives or girlfriends. 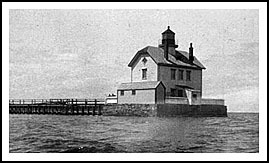 After being destroyed by the hurricane of 1938, the current lighthouse was barged from its location on Crane’s Beach, Ipswich, Massachusetts. After falling into disrepair over the years, the lighthouse gained funding and has been restored and renovated in 2008 (shown in photo at top during restoration). Edgartown contains some of the island’s most elegant homes. Many were built during the booming whaling industry in the 19th century. 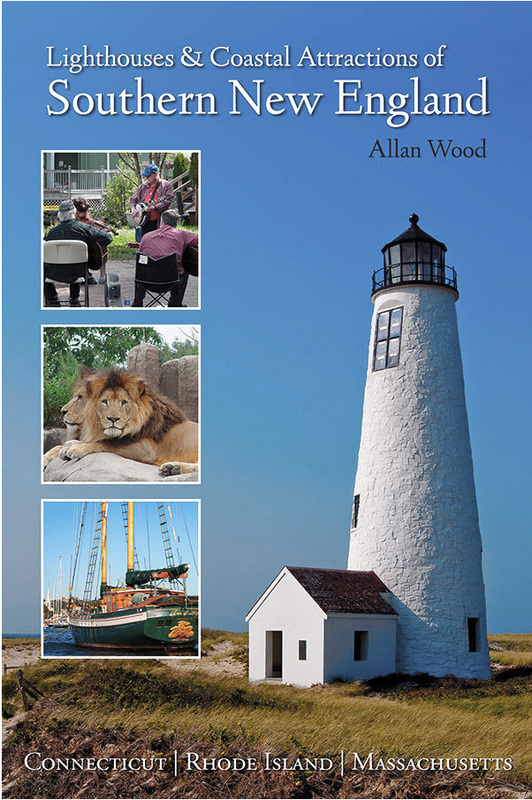 The lighthouse is a short walk from downtown Edgartown, with plenty of specialty shops along the way, and brick lined streets. 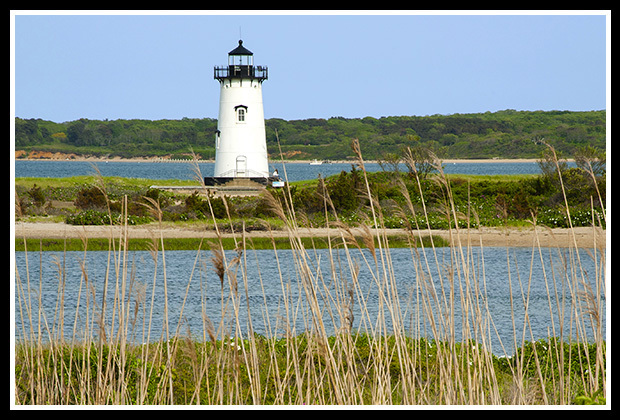 At Edgartown, you can take the tiny Chappaquiddick ferry to Chappaquiddick Island and explore nearby Cape Poge Wildlife Refuge with a narrated tour by the park rangers. The Martha’s Vineyard Museum contains the island’s largest gathering of cultural artifacts, historic records and photographs, and offers lighthouse tours in the summer months. In addition to the historical elegance of this preserved area, there are plenty of beaches and hiking trails to enjoy in Edgartown and all around Martha’s Vineyard. Edgartown is on the eastern end of Martha's Vineyard. The roads from Vineyard Haven and Oak Bluffs will lead you to Main Street in Edgartown. As you approach the harbor, turn left onto Water Street. Follow Water Street north until you see the lighthouse on your right. Parking should be available on the street, and you can follow a path to the light. Most of the boats mentioned below involve ferry service to take visitors to the islands from either the mainland or between the islands. They may also offer other types of cruises.